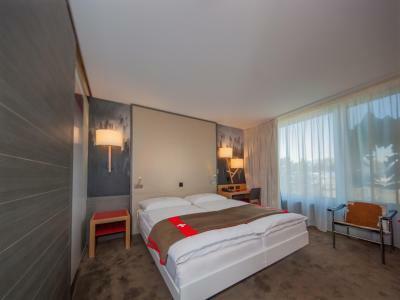 Lock in a great price for Agora Swiss Night by Fassbind – rated 8.7 by recent guests! 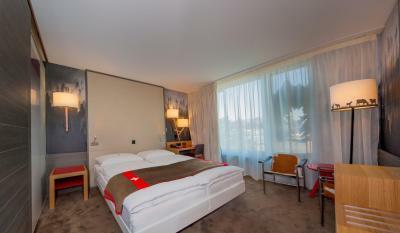 Hotel is well located close to the lake by 10min and train station in 5min walk. Also it is located in a quiet area as well away from the main street. Bed was comfortable and clean rooms. 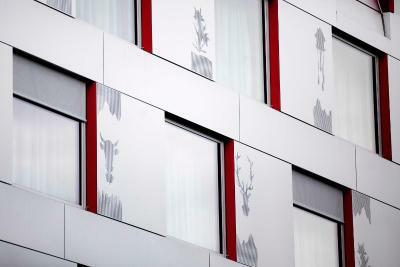 Very modern Suisse style hotel with tiny rooms tho. 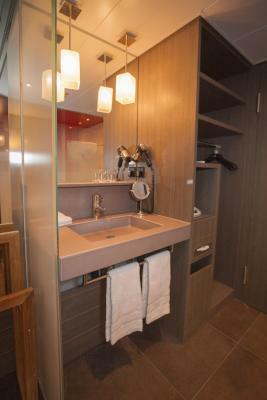 It has its local touch - which is great but in terms of amenities, we didn't find any bathrobes and slippers. But the rest - it was great. 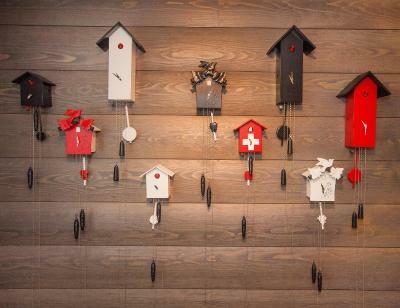 Loved "how Swiss" the property was designed and decorated. 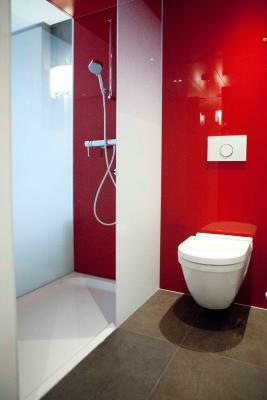 Modern, clean lines, and lots of red and swiss items. Complimentary coffee/tea in the room was a nice touch to start the morning. Very comfortable beds and genius design with a sliding barn door to separate off the bath area if needed. The shower heads are new, modern, and work well with strong water pressure. Enough storage for your things if staying for a short while. 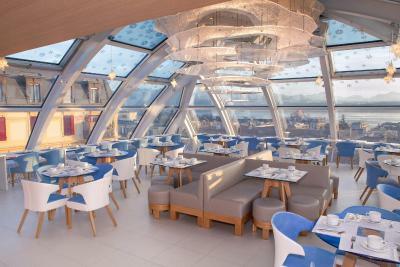 Didn't try the breakfast (although it sounded amazing and I heard the view up on that terrace is gorgeous) because of the cost. 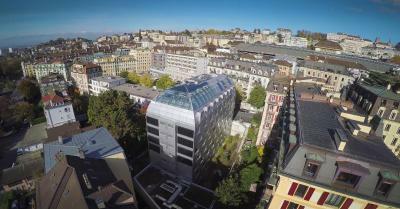 The location is ideal ... a street and a half away from the Lausanne train station. Next door to an amazing Swiss Cafe which I enjoyed for dinner and a block away, a couple of patisseries which offered yummy croissants, pain au chocolate, quiche, and sandwiches, among others. Sleek, clean, modern, great location ... it fit the bill! the location is the best. 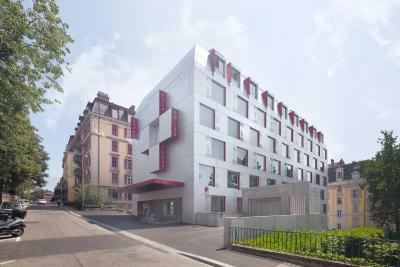 near train station and only walk around 15mins to lake geneva .. 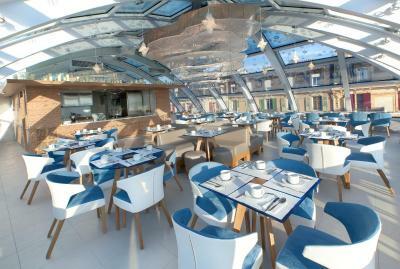 The location of the breakfast overlooking lake Geneva was awesome. 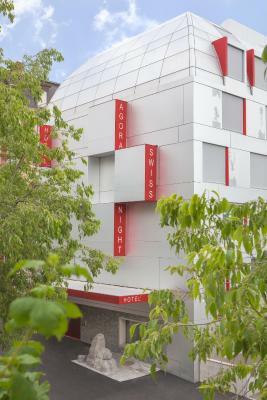 Agora Swiss Night by Fassbind This rating is a reflection of how the property compares to the industry standard when it comes to price, facilities and services available. It's based on a self-evaluation by the property. Use this rating to help choose your stay! 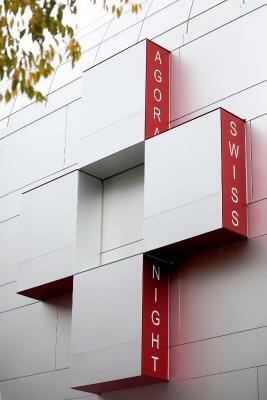 The Agora Swiss Night is in a quiet and green area of Lausanne and has a modern spa and fitness area. 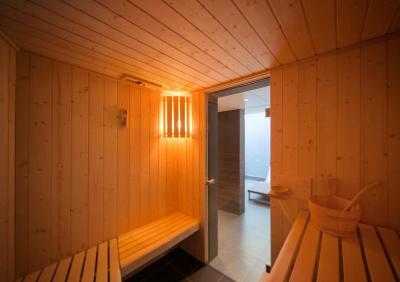 It is a 3-minute walk from the train station and just over half a mile from Lake Geneva. Free Wi-Fi is provided. 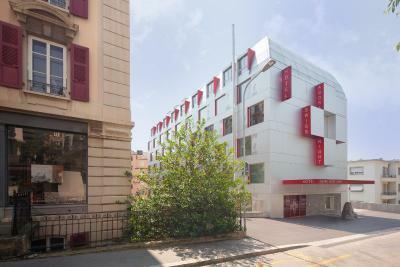 All rooms are air-conditioned and feature large windows overlooking the garden, coffee and tea-making facilities and a flat-screen TV with 200 international channels. The minibar is fitted with beverages and Swiss chocolates. 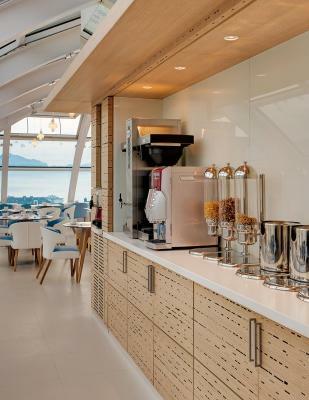 The breakfast room offers panoramic views of the lake, the Alps, and the Jura Mountains. 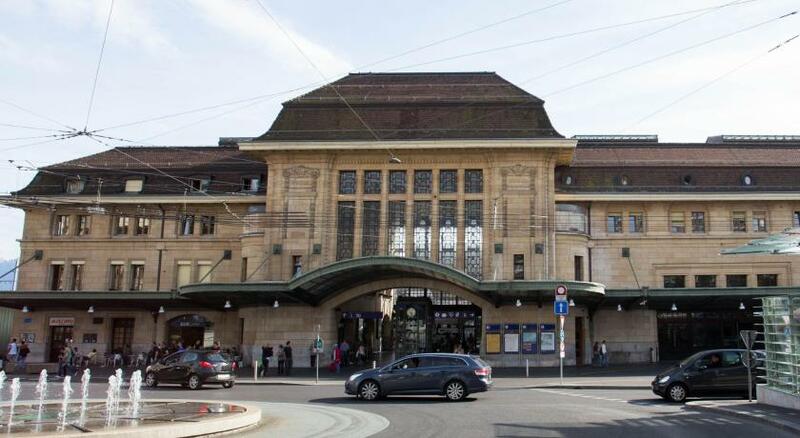 You will be provided with a free card for free use of public transportation in Lausanne when staying at the Agora Swiss Night. When would you like to stay at Agora Swiss Night by Fassbind? Bright and quiet rooms on the upper floors. 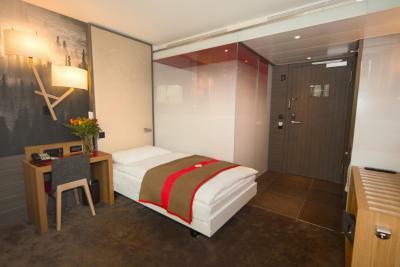 Spacious and quiet rooms on the upper floors. 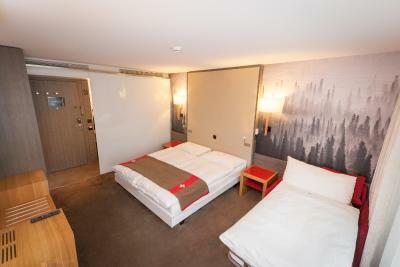 Spacious room with 3 single beds. 1 crib is possible. This studio features a satellite TV, kitchenette and kitchenware. House Rules Agora Swiss Night by Fassbind takes special requests – add in the next step! Agora Swiss Night by Fassbind accepts these cards and reserves the right to temporarily hold an amount prior to arrival. Personally I do not like the puffy pillow as I am not able to sleep well on them. Also pre-booking for the breakfast is charged weather you take it or not. This was a surprise as they ask for during check in if you like to have breakfast. So if you reserve it (even though it is a buffet) and not show up, they charge you. 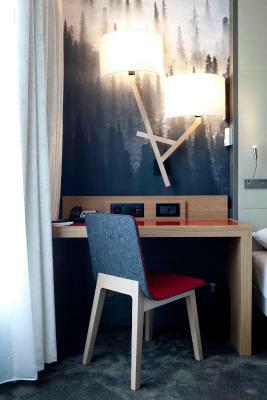 No bar, no business centre, the small desks in the room are fit for a child. Bed is layered out against the bathroom and toilet glass partition, not even a wall. Only one mushy pillow available. Hairdryer is very slow. I was looking forward to the breakfast with view but there is so much condensation on the windows in the morning that you can’t see anything. Coffee is a machine. Poor coffee. Wifi was super slow (200kbps) and breakfast was too simple. 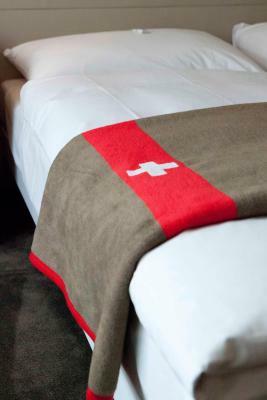 An amazing family owned hotel that celebrates all the very best of Switzerland with brilliant attention to detail and customisation of everything from the walls to bedding to flooring to finishing of rooms reflecting Swiss elements. It's very unique and aesthetically pleasing. Staff were very friendly and polite. The automobile elevator to basement is worth very one of the 20 Swiss francs. Only flaw was the croissants were dry. Comfortable beds. Central location. Metro next to hotel for quick access to city centre. 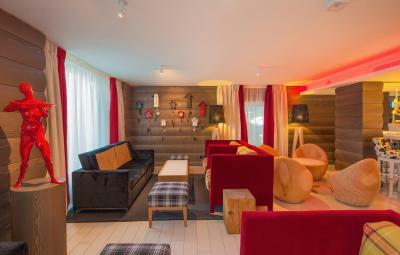 Perfect place to stay at foot of Alps! Gym was ok but only 5 machines, quiet enough to use what I wanted though. The view from the breakfast room was very nice. Room was clean and quiet even though it was closest to the reception. Staff was very nice and it was a quick walk to the lake and the old town. Breakfast was not included and expensive. The welcome, team and service were wonderful. Highly recommended!